For many kids, the last school bell of the academic year rings in a summer of fun in the sun. But for millions of children in every corner of the country, it could mean not knowing where their next meal will come from. Sixteen million children in this country struggle with hunger, and children are often most in need during times when they are not in school, like summer. Federal school lunch and school breakfast programs do not reach food-insecure children when school is out, which means that food banks operating summer feeding programs play a critical role in helping children receive essential nutrients over the summer. Closing the nutrition gap Milk is one of the most nutrient rich foods - especially for growing children. Yet, food banks don’t have enough milk to meet the needs of children who rely on food banks for nourishment. Thanks to an innovative national program from Feeding America, the nation’s largest domestic hunger-relief organization, in partnership with the nation’s dairy farmers and milk companies, there’s an easy way to help close the nutrition gap among children in their communities at this critical time. The Great American Milk Drive is the first-ever national program to help deliver highly desired and nutrient-rich gallons of milk to families facing hunger. According to Feeding America, milk is one of the items most requested by food bank clients, yet there is a nationwide shortage in food banks because it is rarely donated. This means children are missing out on essential nutrients their growing bodies need - such as calcium and vitamin D that support bone development and protein for building lean muscle. Nutrition in high demand It’s been a challenge for Feeding America to meet the demand for milk due to the lack of donations. The items more likely to be provided are canned goods and other non-perishable foods. Now, it’s easier for Americans to contribute nutritious milk to foodinsecure children and families. With a simple click of a mouse (www.milklife.com/give) or text message (text “MILK” to 27722), it’s now possible to buy much-needed milk and donate it for as little as $5.00 to a family who does not have regular access. By entering your zip code, you can ensure that the milk is delivered from the farm to a local Feeding America food bank in your very own community. Feeding America, whose network includes 200 food banks, is encouraging Americans to join The Great American Milk Drive to help provide the muchneeded milk to food banks in their area. 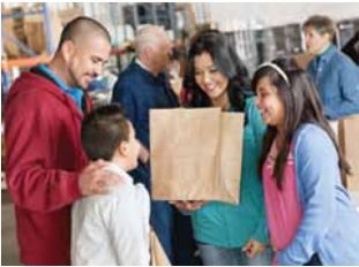 Visit www.milklife.com/give to learn more about the need for more nutritious foods like milk in America’s food banks and how a small donation can make a significant impact to children and families in your community.